Directions: From Dunstable, go north up the A5. At the main traffic lights in the middle of Hockliffe, turn right towards Woburn. After about 2 miles, take the SECOND turn right to Milton Bryan. Pass one right turn, then turn left down a small track opposite the church. Follow this track to the end, passing through a pair of gates into the scout site. Postcode (for The Old Rectory, which is in the same lane) is MK17 9HR. View as you approach Milton Bryan from the Hockliffe Road. I have added some clues, to help you spot the entrance first time, which can be tricky. You will pass public footpath signs to right and left, and there is a cable that crosses the road to a pole on the left. 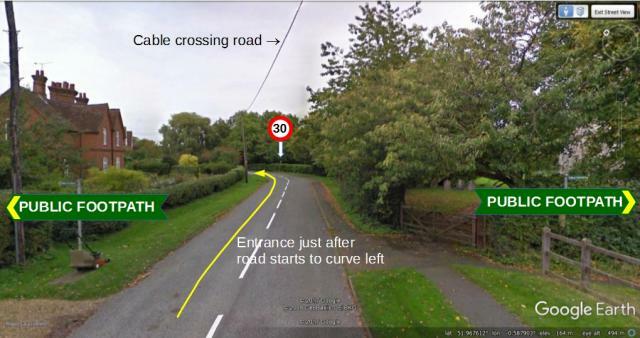 The road starts a curve to the left, and the entrance to the campsite is a small track, just after the start of this left curve, opposite a 30mph sign. The map below shows Dunstable and Milton Bryan. You can scroll and zoom the map, and choose different map styles, using the controls provided at the top right.